A hut with step-thatching and an extended thatched entrance porch, with a buor firescreen in front of it. Often these firescreens incorporated three humps on the top, and were a symbol of a woman's status as a wife and mother of a household. Sacrifices were often made near to the buor of the homestead. To the right a woman can be seen sitting on the ground. According to the film number the image was probably taken during the four weeks in 1935 Evans-Pritchard spent among the Gaajok at Mancom village at the mouth of the Nyanding River, the home village of his servant Tiop. Note on print reverse ms pencil - "83 2" & print front border ms ink - "NUER XII/84"
Morton, Chris. 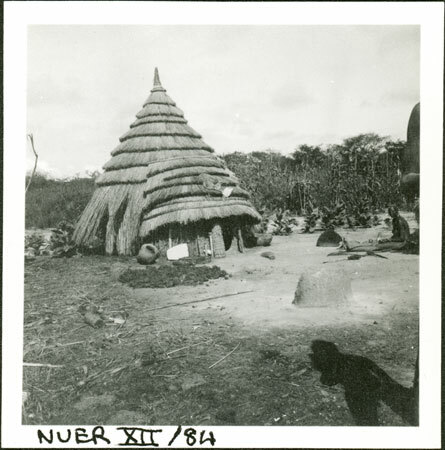 "Nuer hut and firescreen" Southern Sudan Project (in development). 03 Jan. 2006. Pitt Rivers Museum. <http://southernsudan.prm.ox.ac.uk/details/1998.355.592.2/>.